It’s no doubt schools across the nation are still being affected by the February school shooting in Florida. While students and teachers everywhere continue to deal with copycat threats, talk of gun control and safety measures, Matthew Groark’s health class at Washington Township High School gave the nation a reason to smile amid the chaos. Acts of kindness in Groark’s class are not unheard of. After the Marjory Stoneman Douglas High School shooting, Groark, who’s been teaching in the district since 2003, had his classes write and send letters to the affected students. But, another act of kindness in Groark’s class has recently gone viral, and caught the attention of everyone from parents, to WTHS alumni, to the Philadelphia 76ers. After discovering their teacher and his wife had just suffered a miscarriage, Groark’s second-period students pitched in to surprise Groark with 76ers basketball tickets. Groark’s students asked permission to post his reaction to the tickets on Twitter, which caught ample attention on social media outlets, generating likes, comments and retweets. “A lot of negative [is] coming from high schools now, with everything, so for people to read something sweet and positive like that — I think hit a chord with a lot of people, and I think that’s why it’s gotten to the point it has,” Groark said. Groark reached out to WTHS graduate Linda Hanford, who interned with the 76ers and was able to put him in contact with Director of Game Presentation Derrick Hayes. 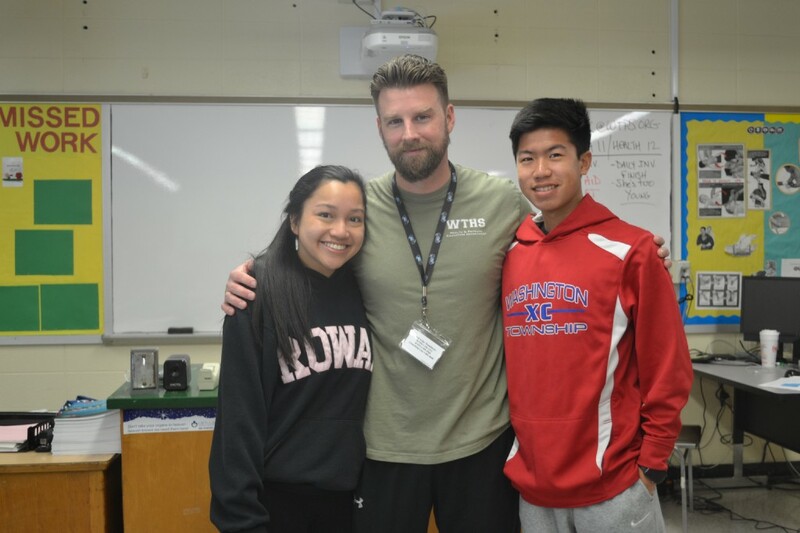 “I emailed him, told him the story, told him what I would love to see happen, and he wrote me back in and hour and said, ‘the Sixers would love to host your whole class,” Groark said. That Friday, Groark surprised his students with the news. They would be joining Groark and his family in a balcony suite at the game. After a healthy pregnancy with their second son, the couple had planned to have a third. They faced another miscarriage last year at about six to eight weeks — marking the couple’s fourth loss. A fertility doctor recommended the couple would be a good candidate for In Vitro Fertilization, to aid in holding onto the pregnancy. Groark said he and his wife went through one unsuccessful round of IVF before they went through the process again. According to Groark, everything was going great for the couple’s pregnancy — they saw doctors weekly and decided to share the news at about 13 to 14 weeks. “We made a formal announcement — all our friends, my kids knew. I spend more time with them than I do my family, at times,” Groark said. Shortly after, the couple was faced with devastating news. Groark returned to school after a week spent grieving, and had to break the news to his class. “Everybody knew I was excited. Everybody knew about the pregnancy. How do you present it to kids that are teenagers?” Groark said. Instead of just going through the motions or not being himself, Groark said he wanted to address what happened. “I sat down — I pulled that chair up, sat down in the middle of the class and we just talked about it. I told them what happened, I cried, and some of them did, and they were silent and they listened. And, I hope they learned a little bit at the same time. The next couple days was spent kind of talking about perseverance, and dealing with things that happen in life. So, we kind of turned it into a lesson,” Groark said. Beyond the tickets, Groark said the heartfelt message that was written in the card is what triggered his emotions most. Groark and his wife, who just celebrated their five-year anniversary, have a 3 and a half year-old son, and a 2-year-old son.